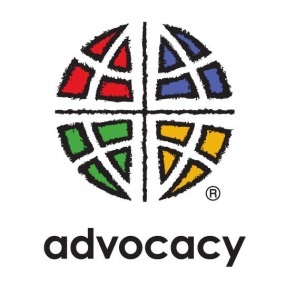 2016 ADVOCACY PRIORITIES: Now that lawmakers have planned their legislative agenda for 2016, ELCA Advocacy is excited to share our policy priorities for this fast-paced election ye ar. We continue to strive for public policies that embody the biblical values of peacemaking, hospitality to our neighbors, care for creation, and concern for our brothers and sisters facing poverty and struggling with hunger and disease. In this election year, Members of Congress will want to pass legislation quickly and early to return to their districts in the summer to campaign with tangible policy results. Check out an overview our 2016 Advocacy priorities. #ELCAvotes: We are called to conversation and prayer around our role as U.S. residents and as people of faith in ensuring our election systems promote dignity and respect for all. We are called to act by speaking out as advocates and engaging in local efforts to guarantee the right to vote to all citizens. Engage with and equip ethnic specific communities to talk about voting rights and race, and their connection with elections today. Sign up to join this effort! Find out how you can get involved and share what you are already doing locally! DHS RAIDS: In January, the Department of Homeland Security (DHS) began operations to track and deport Central American families that arrived in the U.S. after Jan. 1, 2014. As a church with faith partners that work directly with deported children and families in El Salvador and Honduras, we know that deportation does not deter children and families from leaving their communities. We join Lutheran Immigration and Refugee Service (LIRS) in our concern for ensuring access to justice in the U.S. for these families who must navigate a complex legal system, often without necessary support. Read more on the ELCA Advocacy Blog. JUSTICE FOR FLINT, MICH.: Many residents in Flint, Michigan are unable to access safe water to drink, do their laundry, wash their dishes, or bathe. Lutheran congregations, volunteers, and local leaders are now working in Flint to help provide clean water for those in need. As ELCA World Hunger prepares to fund relief efforts, federal funding is critical to replace Flint’s toxic water pipes. Urge members of Congress to provide this funding through clicking here and find out more about Lutheran engagement at the Southeast Michigan Synod page. IMPACT OF INTERNATIONAL PATENT ARRANGEMENTS: In July 2012 the Global Commission on HIV and the Law published the report “Risks, Rights and Health,” which outlines, among many issues, the gap in medical treatment as a result of bilateral and multilateral trade agreements. Evaluating the effects of the increased power of pharmaceutical patent holders, this report notes that by the end of 2010, 77 percent of medically eligible children in low- and middle-income countries were not receiving antiretroviral therapy for HIV and AIDS. On Thursday, Jan. 14, Christine Mangale and Nicholas Jaech of the Lutheran Office for World Community (LOWC) participated in an international webinar regarding the timeline and goals of the High-Level Panel on Access to Medicines, a group appointed by U.N. Secretary-General Ban Ki-moon in November 2015. Within the realm of health technologies, this panel is addressing the current policy incoherence among the rights of inventors, trade laws, public health and human rights law. There is also an Expert Advisory Group, comprised of U.N. agencies and organizations, the public and private sector, and civil society. In March 2016, two global dialogues will be hosted (London, March 9-10; Johannesburg March 16-17) to provide key stakeholders the opportunity to provide their thoughts, ideas and inputs to the panel. 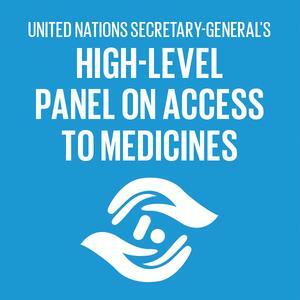 There will be an official report to the U.N. secretary-general on global access to medicines, estimated by June so it is available for meeting on HIV and AIDS later that month. 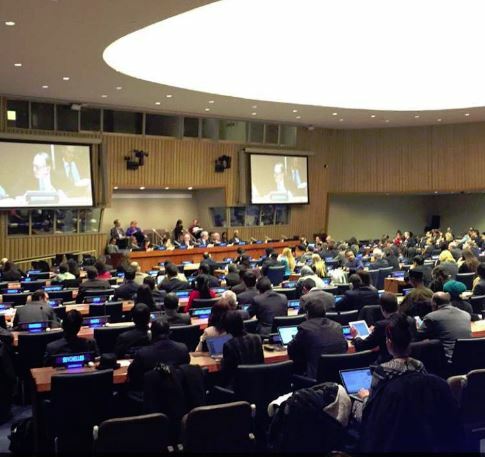 THE HUMAN RIGHTS UP-FRONT INITATIVE: On Wednesday, Jan. 27, LOWC attended a briefing by the U.N. deputy secretary-general on the Human Rights Up Front Initiative. Launched in 2013, the initiative hopes to guarantee early and effective action on behalf of the U.N. system to prevent or respond to “large-scale violations of human rights or international humanitarian law.” The deputy secretary-general called for a “cultural change” of the United Nations to make sure that the staff understand effective prevention tactics – as well as an “operational change” – shared information between development, humanitarian and human rights agencies and organizations. The deputy secretary-general also called for further engagement with member states, encouraging them to adopt aspects of the initiative into their own national and foreign policies. While most member states that spoke during the briefing outlined their support for the initiative, some members had reservations about what they described as an encroachment of U.N. initiatives into national policies, especially concerning human rights. FOLLOW-UP AND REVIEW OF SUSTAINBLE DEVELOPMENT GOALS: On Thursday, Jan. 21, U.N. Secretary-General Ban Ki-moon released a report on the global follow-up and review of the 2030 Agenda for Sustainable Development, which includes the 17 Sustainable Development Goals (SDG). Most importantly, this report highlights ways to “fully use the potential” of the next meeting of the High-Level Political Forum on Sustainable Development, scheduled for July 11-20. This report suggests four parts to the forum: a review of the progress in achieving the SDG, including voluntary national reviews by member states; a specific review of Goal 17, as well as other global partnership agreements, thematic reviews and emerging issues. The report also outlines two potential frameworks for SDG evaluation at all forums on sustainable development convened over the next 15 years. The first is a comprehensive review of all 17 goals to be completed within one year. The second option allows for a comprehensive review but also an in-depth review of each goal, covering all 17 goals within a four-year timespan. According to both options, however, Goal 17 will be evaluated each year. CARE FOR CREATION: LOPP-CA co-sponsored the Green California Summit briefing and reception, the latter attended by a bipartisan list of 18 legislators. The briefing included remarks from diverse legislators from disadvantaged communities, and there was a focus on the plastic bag ban referendum that has qualified for the November ballot. Grounded in the ELCA social statement on “Caring for Creation,” LOPP-CA is part of the effort to retain the ban and a uniform state policy, facing what may be as much as a $50 million campaign to nip this trend in the bud. SENTENCING REFORM: Gov. Jerry Brown released his criminal justice sentencing reform initiative campaign for the November ballot, which was in the works for months. LOPP-CA has been part of a parallel legislative strategy development with an interfaith group convened by the California Catholic Conference, following Brown’s meeting with Catholic bishops a year ago. “Hearing the Cries,” the ELCA social statement on criminal justice, gives impetus to work to change costly policies that can cause further harm and reinforce institutional racism, rather than serve public safety and heal the wounds of criminal acts. RACIAL JUSTICE: LOPP-CA Director Mark Carlson was among a small group of Lutherans scattered among the 25,000 who participated in the annual MLK Walk in Sacramento. 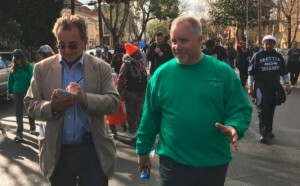 While Mark was chatting with a Sacramento Bee reporter, Pastor Todd Wallace of Good Shepherd, Sacramento, came up to greet Mark. Mark introduced the reporter to Todd and encouraged Todd to walk with them, and he was quoted in the next day’s paper on the remarkable interracial community-building among local pastors and congregations. OPENING DAY: The first day of the 2016 legislative session was Jan. 13. 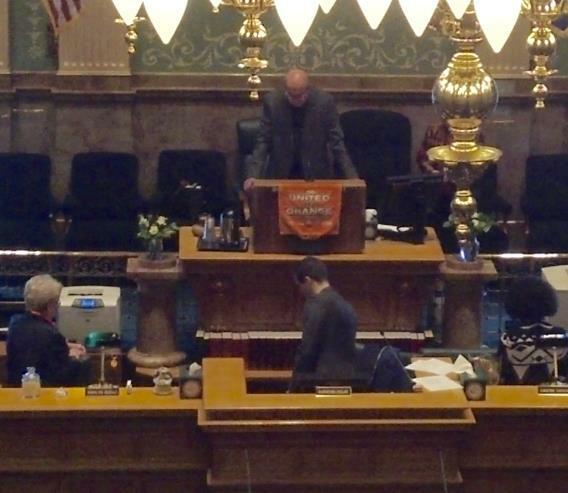 Lutheran Advocacy Ministry-Colorado Director Peter Severson was on hand for the opening ceremonies and has been active in monitoring bills introduced in the first few weeks. Most of the major anti-poverty initiatives are expected to be introduced in February. After hosting Rep. Faith Winter at the Office of the Bishop, an invitation was extended to have a representative of the Rocky Mountain Synod give the opening invocation one morning. Pastor Ron Roschke, assistant to the bishop, took the podium at the Colorado House of Representatives on Friday, Jan. 22, to offer a prayer of thanks for public servants. He also asked the assembly to remember God’s concern for the poor, hungry, sick and imprisoned. Peter Severson and ELCA World Hunger and Disaster Appeal Director Dan Rift, from the ELCA churchwide office, were on hand as well. CONGREGATIONAL VISITS: Lutheran Advocacy has been on the road in January, visiting congregations from Denver to Vail/Beaver Creek to Delta, as well as Lutheran-Episcopal Campus Ministry at the University of Northern Colorado. FAITH ADVOCACY DAY: Colorado Faith Advocacy Day 2016, hosted by LAM-CO, will be Saturday, Feb. 20. The theme is “Income Inequality: Who Gets Left Behind?” All are invited to join! Register at www.rmselca.org/advocacy. BILLS INTRODUCED: Although the legislative session starts March 8, more than 230 bills have already been filed in the House. Several Minnesota Senate committees have also been meeting for several weeks. ENERGY BILLS: Of the current House bills, four impact energy policy. Three were introduced by Rep. Pat Garafalo, Farmington, chair of the Job Growth and Energy Committee. This is the committee that tried last year to roll back previous clean-energy gains. We are still evaluating the bills with our partners. TAX ISSUES: A rumored deal would allow proposals for significant tax policy changes. Thus far, 17 of the House bills are tax related. They include small tweaks, exemptions for special interests, and radical change including repeal of state/local property taxes. While taxes are not a primary issue for LA-MN, we could weigh in on equity concerns impacting low-income people. LENTEN REFLECTION HANDBOOK: (from Minnesota FoodShare): See www.gmcc.org/file/lenten.pdf. The first reflection for Ash Wednesday, based on Isaiah 58:1-12, was written by LA-MN Director Tammy Walhof. Interested in being part of our Rapid Action Network? Send your contact information to LA-MN Director Tammy Walhof at tammy@lcppm.org or 651-238-6506. STATE LEGISLATURE: The 2016 session of the Legislature is underway just as the latest Kids Count study reveals that our state now has the worst rate of child poverty in the nation at 30 percent. New Mexico also has the highest unemployment rate at 6.7 percent. To add to the situation, the state revenue projections are dire as the price of oil drops almost daily bringing the certain specter of budget cutting to balance the state budget. Adding to the background of the session is the fact that all 112 legislative seats are up for election this year. The LAM-NM 2016 Advocacy Agenda continues to focus our work on issues affecting people living in poverty and experiencing hunger. SERVICE PROGRAMS: LAM-NM supports full-funding for Medicaid expansion. Over 250,000 low-income New Mexicans have been added to the Medicaid program under the Affordable Care Act and about 40 percent of New Mexicans are now enrolled in Medicaid, which reflects the pervasive poverty throughout the state. We are also working for a modest increase in the state-funded SNAP supplement program for seniors and people with disabilities. However, the revenue projections require joining with other advocates to try to avoid budget cuts to existing human services and other programs. STATE BAIL: A constitutional amendment to reform the state bail system has passed its first committee hearing and moves on despite the opposition of the bail bond industry. Of particular concern to LAM-NM is changing the constitution so that non-dangerous defendants cannot be detained pre-trial solely because they lack the financial resources to post a cash or surety bond. Ohio’s Legislature has returned from their holiday break with a full calendar in front of them. The Legislature will work on a capital budget over the next few months to allocate resources for building projects. They are also looking at Ohio’s unemployment compensation system. HB 394 will cut benefits to those unemployed and limit many low-wage workers from qualifying for assistance between jobs. The issue of Ohio’s unemployment compensation system has to come to the Legislature’s attention, because we continue to owe the federal government for money borrowed during the Great Recession. HB 394 will hurt families struggling to get by and leave the system short on revenue. The Ohio Legislature should strengthen assistance for individuals and families who are in between jobs. For more information about HB 394 or other legislation before the Legislature, contact Nick Bates, diaconal minister in the Southern Ohio Synod at Batesyep@gmail.com. As Pennsylvania heads into its eighth month without a budget, LAMPa has been working with coalition partners around hunger, human services and education to develop recommendations for the upcoming budget year ahead of Gov. Tom Wolf’s budget address on Feb. 9. 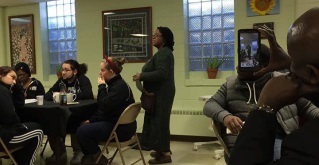 Interim Director Tracey DePasquale attended Trinity Institute 2016, “Listen for a Change: Sacred Conversations on Racial Justice” at Lutheran Theological Seminary at Gettysburg. She also attended a meeting of the Trauma Informed Education Coalition in Coatesville. The Virginia Interfaith Center for Public Policy held its “Day for All People” on Jan. 20, with about 250 participants who heard speakers on various issues and then attended the General Assembly to meet with their legislators. Legendary preacher Dr. James Forbes was the keynote speaker, talking about America’s ongoing racial divide. Organizers were excited by the attendance of several student groups, including a group of Muslim students from a school in Richmond. Because the Legislature is in session, Virginia Consumer Voices for Healthcare, part of the Interfaith Center, is busy attending hearings and advocating to “close the coverage gap.” Virginia is one of 18 states that have not accepted federal Medicaid funding. Finally, the center will have a new executive director starting Feb. 9. Kim Bobo from Chicago, a nationally known advocate for social justice and interfaith cooperation, who wrote a book on faith-based organizing, has accepted the position. MORE ON HUMAN TRAFFICKING: LOPPW/Cherish All Children’s team has set dates for conferences: June 25 in Wisconsin Rapids, at the edge of East Central, bordering La Crosse Area and South-Central; July 9 in Superior in Northwest; and Sept. 14 in Madison in South-Central for a statewide conference and rally. The LOPPW director testified on two anti-trafficking bills. FEDERAL: Advisory Council Member Eric Larson has made the Child Nutrition and WIC Reauthorization Act known in the Northern Great Lakes Synod. Most recently, Zion Lutheran Church in Marinette is making the legislation and their response to it using Washington, D.C.’s, post cards and the handout, Combatting Childhood Hunger, part of their emphasis during their hunger and poverty education and action. 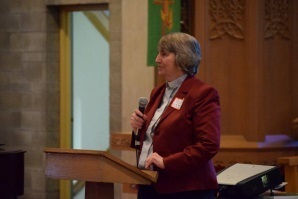 SYNOD EVENT: LOPPW’s director gave a brief presentation on LOPPW and highlighted 2016’s focus on ELCA World Hunger at Lead and Learn in Milwaukee; she was also part of a panel on social justice. « Previous Post: The Paris agreement: What’s next?